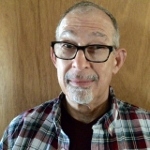 Frank Faine is a spiritual director, Veriditas-trained labyrinth facilitator, and retreat leader living in Orlando, FL. He is also the TLS Regional Representative for Florida. He is also currently completed a TLS Special Project on ways to use the labyrinth experience/walks on college university campuses in Central Florida. With a rich and diverse background in companioning, healing and teaching, he offers spiritual direction, labyrinth walks and retreats to all persons on their journeys to embrace a life affirming spiritual path through his organization Steps, Stories and Songs.